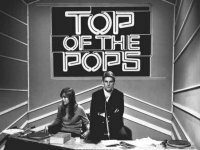 From a pilot show called 'Teen and Twenty Record Club' based loosely on the BBC's radio show 'Pick Of The Pops' this was purely a top of the charts show and became the longest-running British pop vehicle, reaching its greatest heights in the mid-Seventies. Only six programmes were originally pnned but, due to its immediate popularity, was extended indefinitely after only the second. Transmitted on Wednesdays (later Thursdays) the entire show had to be put together in about 24 hours as the week's chart was released at 8:30 a.m. on a Tuesday morning. The original presenters were David Jacobs, Alan 'Fluff' Freeman, Jimmy Savile and Pete Murray who were generally considered to be the country's best at the time. The original producer was Johnnie Stewart who was responsible for the show's success and growth during the Sixties and early Seventies. His trademark logo silhouette always appeared beside his name on the closing credits. Another original producer was Neville Wortman, whose reminiscences can be read here. The four original DJs compered the show in strict rotation, with the following week's DJ appearing in a cameo 'handover' at the end of the show. Assistants included Diane Hefforan, Denise Sampey (who span the discs on the first programme) and Samantha Juste (who took over the role from Denise and eventually married Monkee Micky Dolenz after they met on the show). The first show was broadcast on 1st January 1964 from a disused church in Dickenson Road, Manchester, (because most of the other BBC studios were busy at the time) which had been acquired by the BBC and fitted out as a studio some years earlier. At 6.34 p.m. a new era in Pop was born with the opening titles, accompanied by the theme music 'Percussion Piece' by Bobby Midgley, followed by Jimmy Savile introducing The Rolling Stones performing 'I Wanna Be Your Man'. This show also featured other 'live' acts Dusty Springfield ('I Only Wanna Be With You'), The Dave Clark Five ('Glad All Over'), The Hollies ('Stay') and The Swinging Blue Jeans ('Hippy Hippy Shake'). Discs and filmed items shown were Cliff Richard and The Shadows ('Wonderful Life'), Freddie and The Dreamers ('You Were Made For Me'), Gene Pitney ('24 Hours From Tulsa') and news clips of The Beatles to the sound of 'I Wanna Hold Your Hand'. In the early days, acts appearing on the show mimed to the commercial recording of their song - not because they couldn't play/sing (questionable in some cases), but to achieve a higher transmission sound quality. This changed in 1966 when the Musicians Union banned artists miming to their actual records. After some bands' attempts to play live fell well below acceptable levels, a compromise was fairly quickly agreed where a specially recorded backing track was allowed to be used as long as all the musicians participating were also present in the studio. 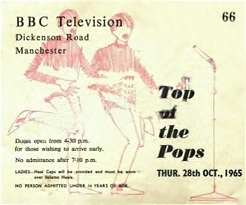 In addition to this, the 'Top of the Pops Orchestra', directed by Johnny Pearson, also provided some live backing to certain artists, an arrangement that continued until 1980. Vocal backing was provided by The Ladybirds - Maggie Stredder, Gloria George and Marian Davis. As with Ready Steady Go, a live studio audience were able to dance to and, in the early years, meet and mingle with the stars.By mid 1967 the Manchester studio had become too small for the increasingly complex production and it was moved to Lime Grove studios in London. From there it went to Studio 2 at Television Centre and, eventually, to the huge Studio 5 back at Lime Grove. Also at this time, the show started using 'guest' DJs, the first of which were Emperor Roscoe, Kenny Everett, Stuart Henry and Simon Dee (whose TOTP career only lasted a few months before he was given his own show). Stanley Dorfman (former producer): "The show at that point was pretty much a teenybopper type show. When it moved to London it became chic, it became stylish – introduced by Pan’s People. There was a wonderful choreographer called Flick Colby…"
Live television threw up all kinds of problems, one of the most memorable being in March 1967 when, in his first appearance on TOTP, Jimi Hendrix was announced by Pete Murray and was quite bemused when he started his 'mime' to the sound of an Alan Price record. Never lost for a quick comment, Jimi was heard to say 'I like the voice, man, but I don't know the words' just before the camera switched to Pete Murray doing a quick cover-up while the sound engineer frantically searched for the tape of 'Purple Rain'. Another 'goodie' was on the November 9th 1967 200th edition show when the normally immaculate Gene Pitney completely forgot the words to his song and just made it up as he went along, giving rise to an extremely dubious 'lip-synch'. This show, like the first, was introduced by Jimmy Savile. Live acts seen were The Dave Clark Five ('Everybody Knows'), Val Doonican ('If The Whole World Stopped Loving'), The Kinks ('Autumn Almanac'), the unfortunate Gene Pitney ('Something's Gotten Hold Of My Heart') and The Foundations ('Baby, Now That I've Found You'). Filmed items were Dave Dee Dozy Beaky Mick and Titch ('Zabadak'), The Who ('I Can See For Miles') and Donovan with 'There Is A Mountain'. Guests on this special edition show included two of The Bee Gees, Lulu, Alan Price, Paul Jones, Graham Nash, Scott Walker and DJ Simon Dee. So, one of the great attractions of the show for some of the male viewers during the Sixties and Seventies were the dance troupe Pan's People who joined the show in 1967 (dancing to 'Mony Mony' by Tommy James and The Shondells) after the departure of the 'The Gojos'. Choreographed by Flick Colby, they performed their dance routines to backing music from current chart hits in a variety of (sometimes bizarre) outfits. They usually had a maximum of one week and, occasionally, only 24 hours to perfect their routine for each show. They were paid the minimum equity rate of £56 per week. The original Pan's People line-up was Flick Colby (who soon stopped performing to concentrate on the choreography and business side), Ruth Pearson, Babs Lord, Dee Wilde, Louise Clark and Andi Rutherford (Cherry Gillespie replaced Andi when she left to have a baby in the early Seventies). "I think people did think we were objects but I don’t think that’s true. People knew our names, we ran our own group, we handled the business side of it and nobody ever made us do anything we didn’t want to do..... I think it was kinda outrageous and it was our chance to take the mickey just a little bit." "They weren't Broadway-standard routines...we were definitely doing watercolours, not oil paintings". The theme music probably most associated with the show was CCS's version of 'Whole Lotta Love', but during the Sixties it was an instrumental piece written by Johnnie Stewart and Harry Rabinowitz. It was first performed as a percussion piece by Bobby Midgly, replaced by another version of the same piece played by a five-piece orchestra and later a third version played by Johnny Pearson's Top Of The Pops Orchestra. The show celebrated its 250th edition in October 1968 when live acts included The Tremeloes and The Love Affair. Mary Hopkin was at No.1 with 'Those Were The Days' and The Beatles at No.2 with 'Hey Jude'. "This is BBC One ......... Yes it's number one, it's Top of the Pops!" The Beatles Shea Stadium film was shown, featuring 'I Feel Fine' 'Help!' and 'Twist And Shout'. Note: Of the first 500 episodes transmitted, between 1964 and 1973, only about 20 complete recordings are held in the BBC archives, most of which are from 1969 onwards. The earliest recording is from 26th February 1964 and contains performances by The Dave Clark Five and Billy J. Kramer and The Dakotas. Some partial programmes exist as well as two examples of footage from 1965 rehearsals, one of which includes Alan Freeman introducing The Seekers and one with Sandie Shaw rehearsing 'Long Live Love'. 15th February 1968 There are also recordings of shows that only exist in their unedited form. The oldest complete episode in existence was the one originally transmitted on Boxing Day in 1967. 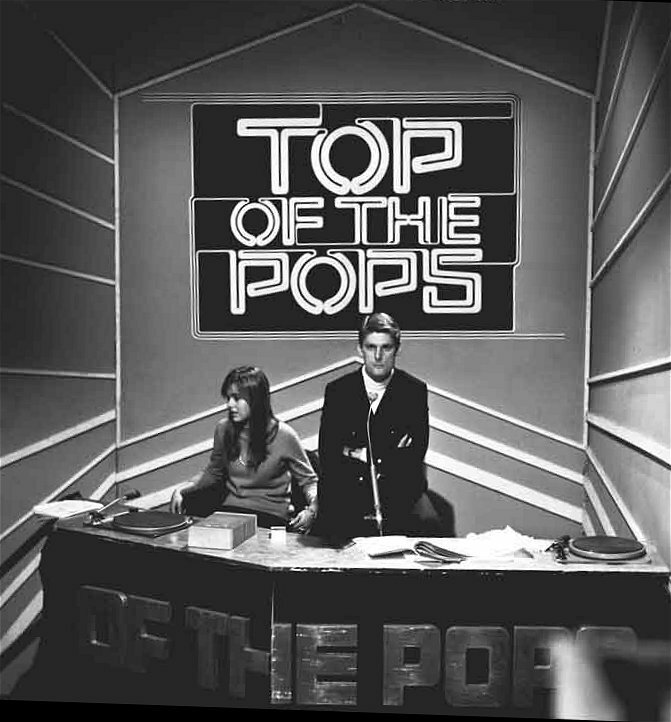 Some other scenes from TOTP also survive in some form due to their having been included in other programmes, either by the BBC itself or by foreign stations. The only surviving footage of The Beatles on the programme actually comes from a 1965 episode of Doctor Who - 'The Chase'.